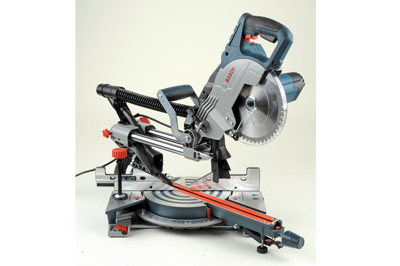 By now there's got to be a mitre saw on the market to suit every end user and once you've established your budget and specific requirements, what's left to make you choose one machine over another? This compact machine is well spec'd for a start with all the usual features like a trenching facility, a good range of presets in bevel and mitre mode and extending table either side of the turntable. 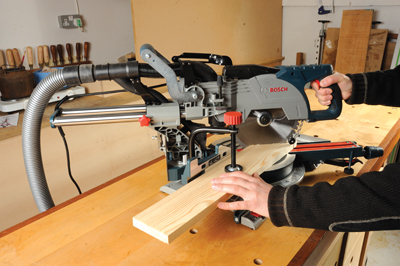 The working area goes from 440mm wide to 740mm and with a cut stroke of 300mm it's got plenty of capacity. Mitres between 52° left and 60° right and bevel cuts of 2° to 47° should cover most things. The working surfaces are all well machined cast aluminium without a single rough edge to be found, suggesting a build quality way above average. Both back fences are pre-drilled to make installing a break-through fence of your own fairly straightforward. Dust extraction is via two ports - the first positioned behind the blade at the source of the cut and the second behind the fence. A chip deflector helps to drive the waste material into the airflow. There is a lot of fine adjustment on this machine that will allow you to calibrate it to achieve good results in each mode. 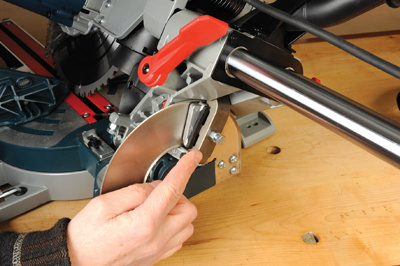 The lever cam lock used to set up for bevel cuts has a tension setting so you can adjust it to be able to nudge up to a precise angle if required. With the GCM 8SJL Bosch have covered all the basics extremely well but there are a couple of nice touches that make it well worth considering; a well placed carrying handle and lens protector for the laser.